← Why Make Use of a Tourism Brokerage Firm for your Travel or Holiday Arrangements ? PILGRIM’S Rest is full of interesting people and places. Two of the best-known characters in the village were Claude Cogill and Michael Owen. The manager of the Graskop branch, Mac McDonald, took Barclay’s News reporters to meet them at “The Diggings” where Claude entertains visitors with tales of Pilgrim’s Rest and demonstrations of panning. His job was to assay the bullion before it was sent to the Rand Refinery, where the silver was extracted. Against the assay certificates he issued, Barclay’s Bank at Pilgrim’s Rest was allowed to payout the value in money. Claude recalls a famous character from the past, Bert Longstaff from the Jubilee Mine who used to ride through the town on his horse, whistling as he rode. He clearly remembers Mine “big boss” of TGME, Mr R. A. Barry, who was the mine manager who lived and ruled from the big house at the end of the town. Some years ago Claude bought the Mali Dyke Mine from Rand Mines which he continued to operate it in a small way. His only son Professor Charles Cogill is an industrial psychologist at Natal University. “He collects university degrees – I collect gold,” quips the highly articulate Claude. Michael Owen, his great friend, does not look anywhere near his 82 years. A Welshman from Caernarvon (Wales); Michael has lived in Pilgrim’s Rest for 64 years. His was one of the 21 Welsh families that settled in the town. He also began his mining career with TGME and stayed with them all his working life. Today he is the last Welshman left in Pilgrim’s Rest. He recalls: “There was a lot of singing here once upon a time although not everyone in the choir was Welsh – we had a few Germans”. He has even learned to speak Afrikaans, “with a Welsh accent”, he chuckles. Claude and Michael have seen Barclay’s Bank change from a full-time bank, “the only bank here” to being a thrice-weekly agency of the Graskop branch. OMG. So interesting finding a very dear family friend after all these years , a good friend of my mothers and brothers from Pilgrims Rest days from the cottage we had at Pilgrims Rest. Claude Coghill and Malidyke Mine at Pilgrims Rest. I remember talking with him as a very young gal and spending holidays at Pilgrims Rest. Thank you for this fantastic find and wish I knew how to contact Claude Coghill again. Anne M. Gieg (nee Edwards) – niece of the late Noel Hawthorne Johnston. 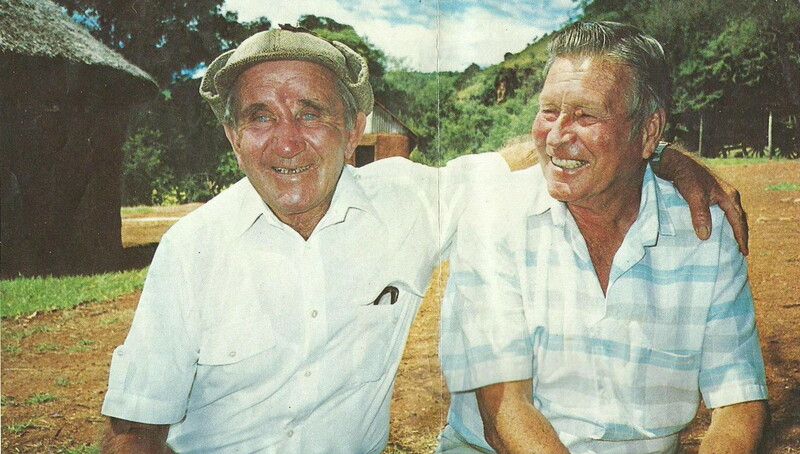 (uncle) and very good friend of Claude Coghill – my uncle mined at the Pilgrims Rest mine many years ago. My mother was very good friends with a Ms.Baretta and Mr and Mrs Kiernanda (now deceased) of Pilgrims’ Rest. I’m trying to trace & locate email addresses & phone nos. for the other Coghills who may have info. for you. I am the daughter of Les and Bettie White and wonder how many of us can still connect to those years of being together.